Julienne is simply 'cut into little sticks'. Place two types of dried mushrooms in separate bowls. Add enough boiling water to each to cover the mushrooms. Let stand until the mushrooms are soft. Drain the mushrooms, squeezing them lightly. Cut off and discard the stems from the black mushrooms. Cut the caps into thin strips. Cut off any coarse, woody stems from the cloud ear mushrooms. Cut the mushrooms into half-inch pieces. 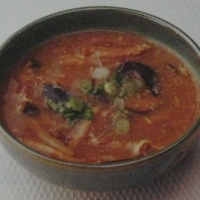 Combine the stock and the mushroom liquid in a sauce pot. Add the mushrooms, pork, bamboo shoots, soy sauce, and white pepper. Mix the cornstarch with the water until smooth. Add the cornstarch mixture to the simmering soup, stirring constantly. Simmer until the soup is lightly thickened. Add the vinegar and sesame oil to the soup. Slowly drizzle in the beaten egg, stirring slowly but constantly, so that the egg coagulates in thin shreds. To serve, top each portion with a few slices of scallion and a pinch of chopped cilantro. To cut the pork into julienne more easily,, partially freeze the meat first. Thanks for Posting This One,,,,,,YUUUMMMMMMM!!!! Sounds good Elaine!! Chinese is an all time favourite. Hope u are doing good. havent heard from u in a long time. God bless u n ur family. I Love hot and sour soup as well as egg drop soup. This sounds great, I will give it a try. Sounds great Elaine!This will be great this winter.Since you are a Chef, what do you think about Chef Ramsey? This sounds great. Can you sub the tree ear mushrooms?